Exchange Family Center works tirelessly to see a world where all children are safe - physically and emotionally - and have the resources and support to guide them and their caregivers through life’s difficult moments and to impact families by providing accessible education, counseling, and support to break dysfunctional patterns of generational abuse and neglect to produce emotionally healthy adults in our next generation. Through our Early Childhood Outreach Program (EChO), we provide Early Childhood Mental Health Consultation (ECMHC) to strengthen teachers’ abilities to nurture social-emotional development in the young children that rely upon them. Last year, 71 children age birth to five who were at-risk of expulsion from their childcare centers were provided with targeted support in their classrooms. 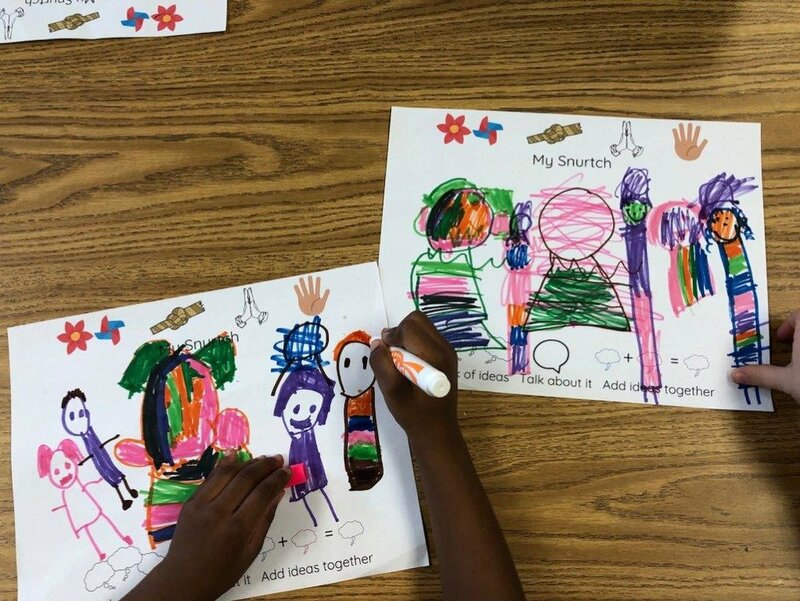 Exchange Family Center’s EChO program interventions resulted in 87% of students making social-emotional development gains and exhibiting fewer behavioral concerns in their classrooms! A big step in the right direction of preventing expulsion for these young children. Recently, our friends and supporters at the Forest at Duke, granted us vital monies to expand our services to a preschool classroom at Yates Baptist Child Development Center on Chapel Hill Road in Durham. Melissa Bent, Exchange Family Center Early Childhood Outreach (EChO) Consultant and Janelle Fenwick, a speech therapist with Express Yourself NC, work closely together to deliver a 10-week therapeutic Building Social Skills pilot program for targeted children from the center’s pre-k classroom. The weekly therapeutic group is then expounded upon later with the rest of the class, as the program advances. The follow-up session is led by the Exchange Family Center’s EChO consultant and is aimed at building the preschoolers social- skills and encouraging everyday classroom use of the materials from the social group. We are thankful to The Forest at Duke for funding this pilot Building Social Skills group. If you’d like to know more about the Building Social Skills groups or more about Exchange Family Center’s Early Childhood Outreach Program (EChO), please contact Melissa Bent, Senior EChO Program Consultant at: melissab@exchangefamilycenter.org. Newer PostDurham Mag: "Making Moves!"